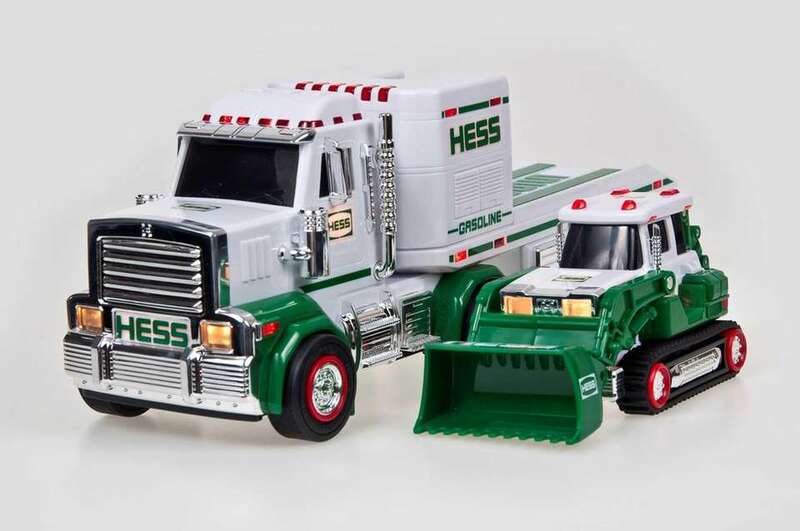 Every holiday season, there is one toy that appears on the wish lists of many kids and adults alike: Hess Toy Trucks. 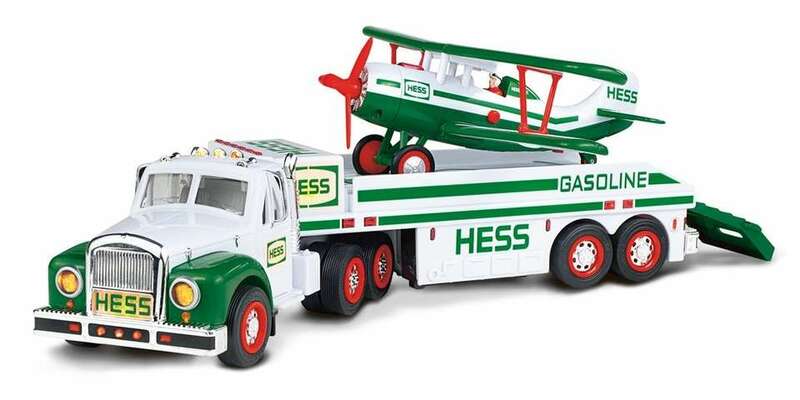 This year marks the 53rd year of Hess Toy Trucks, and has been a holiday tradition since 1964. The latest truck is available at hesstoytruck.com. 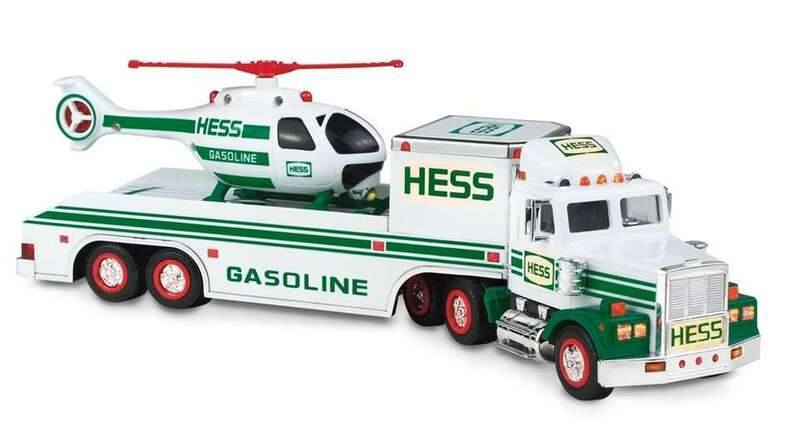 Here, we take a look at the history of Hess Toy Trucks, from 2018 through 1964, which includes a patrol car, an SUV, helicopters and more. 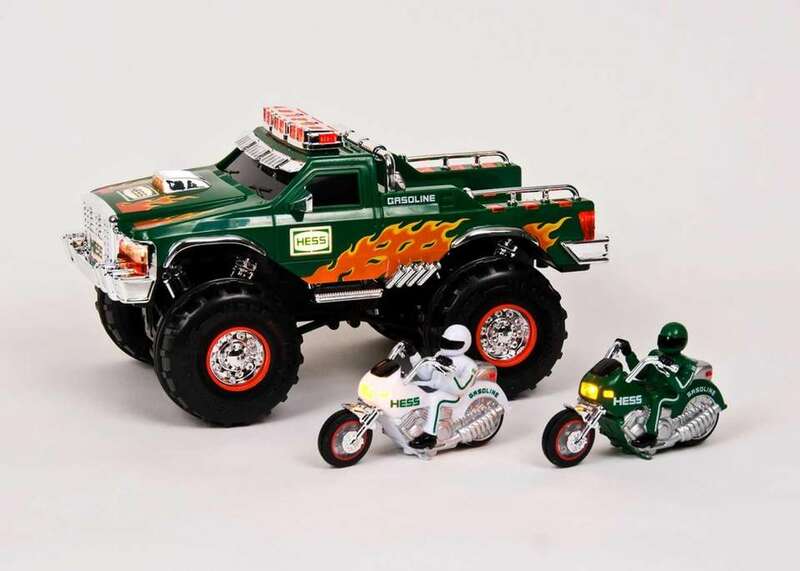 This year's RV truck features a modern green and chrome design with 60 LED lights and three ramp doors that fold down to reveal the ATV and motorbike. The oversized-style ATV and touring-style bike come with racing motors and have the ability to pop wheelies. 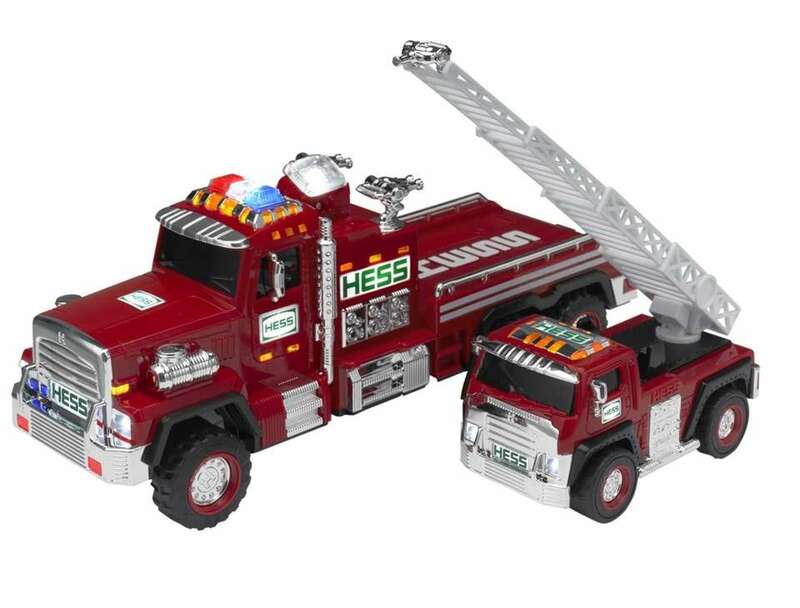 The three-in-one combination has 73 lights, the most ever on a holiday Hess Toy Truck package. The latest truck features a hydraulic powered lifting bed, LED lights, sound effects and a working tailgate with a slide-out ramp. The loader includes an excavator and bucket, which propels itself in several directions via dual-track treads and a rotating cab. With 350 parts, it's the heaviest and most complex truck in the Hess fleet. 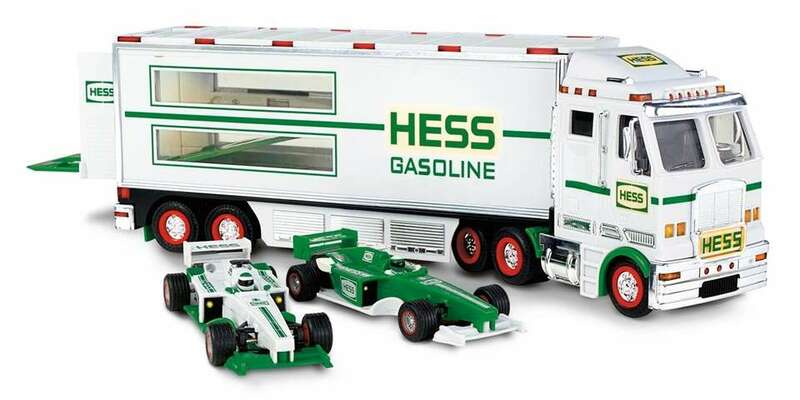 The Hess Toy Truck features LED lights, a slide-out ramp and four sounds, including a race start countdown. The dragster features a pull-back motor, which enables it to launch in either a flat or wheelie position. The set features more than 50 lights. The oversize tires, swiveling chrome-detailed fire-hose nozzles, LED lights on this fire truck also feature a high-powered pivoting LED searchlight, a slide-out ramp and four realistic sound effects. The accompanying Ladder Rescue features a rotating extension ladder with a movable nozzle and a push-activated friction motor. Hess spent three years designing every detail of the toy that would mark the 50th anniversary of one of the longest-running toy lines in history. The Space Cruiser has retractable landing gear, eight lights and six sounds, plus a button-activated ignition, flyby and land effects, and motion-activated sounds for climbing, diving and turning. The Scout also has lights and folding wings. The Cruiser and Scout sit atop the flatbed truck, which is marked with chrome "50" emblems on the cab. The truck features 41 lights, multiple sound effects and a button-activated launch ramp with accompanying hydraulic lift. The front of the toy features a chrome grille and bumper and light fixtures. Pulling or retracting the hidden rear-loading ramp activates the sound of ramp extension and sets warning lights flashing. The fully motorized tractor moves forward or in reverse and its digging equipment includes a swiveling backhoe and a front bucket with a release button for digging and hauling. 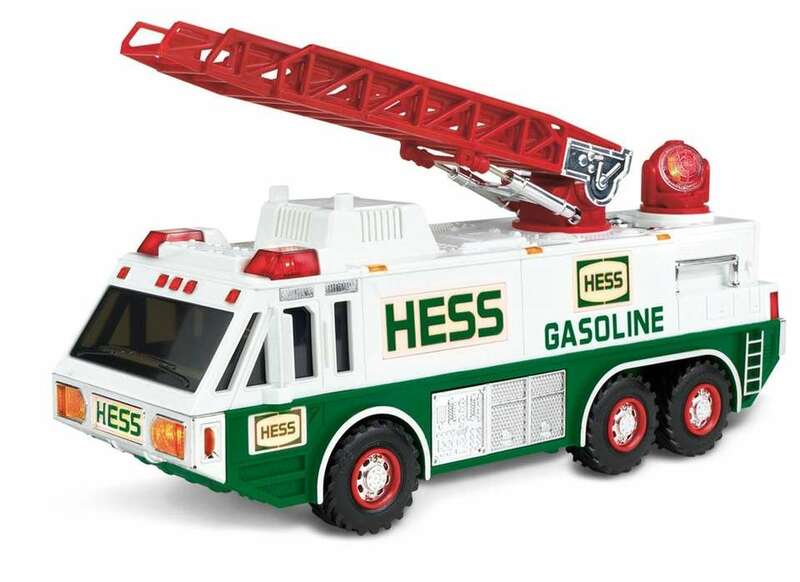 One of the only three Hess releases to feature a non-road vehicle as the big toy. Activate the chopper's motorized main and tail rotors using a button on the front side or a switch on the undercarriage. It also features high-powered pivoting searchlights, retractable landing gear and three sounds: ignition, takeoff and flyby. The Rescue vehicle is a six-door SUV featuring a taut friction motor and retractable emergency roof lights. 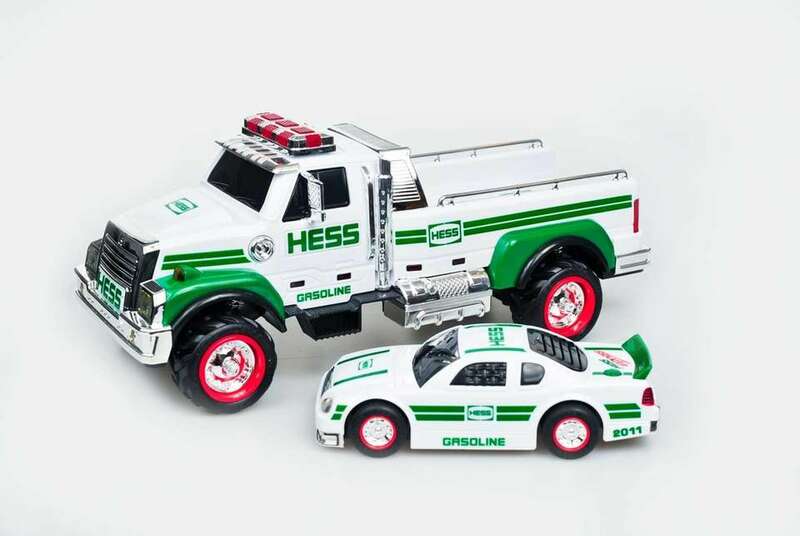 The chrome-detailed truck introduced the first four-wheel independent suspension on a Hess toy. This lets the truck sway and bounce with the wheels firmly on the ground. Pulling out the hidden ramp at the back of the truck activates the sound of a hydraulic ramp sliding into position. The stock-car racer came with powerful lights and sounds -- a four-speed engine sequence that starts when you press the gas cap. 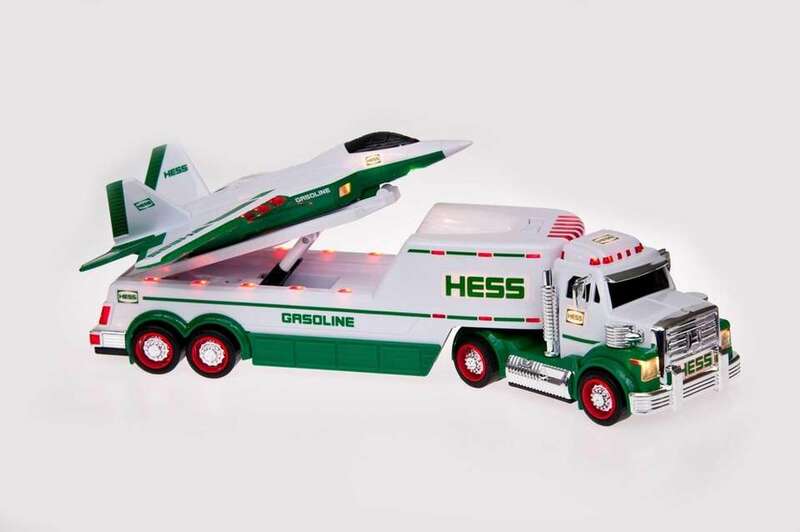 Hess' first jet into the fleet, the tractor-trailer that transports the jet features a hydraulic-lift launchpad, complete with runway lights. Based on an F-22 Raptor, the jet comes with motion-triggered sounds: Hold it flat to hear a steady engine hum, bank right or left for a shift in tone or point the nose down and hear the engine scream. The aerodynamic race car is loaded with realistic features, such as ignition, acceleration, horn sounds, 29 lights and a rear spoiler. When pressed, the front hood of the car opens to reveal a hidden mini-racer. The smaller racer is equally impressive, armed with a pull-back friction motor for increased velocity. 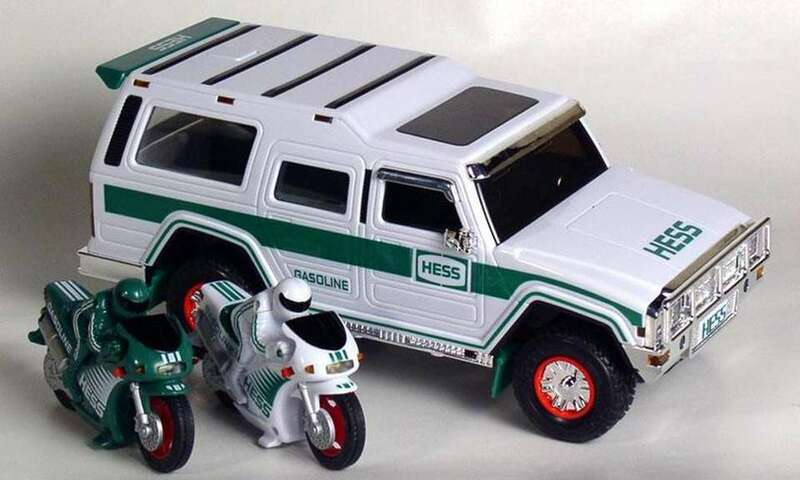 Both cars came with low-profile headlights, a first for a Hess Toy Truck. This two-in-one toy has shiny chrome details, bright lights and special features. Five buttons on the truck cab activate flashing lights, a backup alert signal, a gigantic-sounding horn and a startup ignition sound. The largest button activates the first-ever hydraulic lift, a sound-enhanced feature that raises the truck bed at an angle, so the Front Loader can roll off. 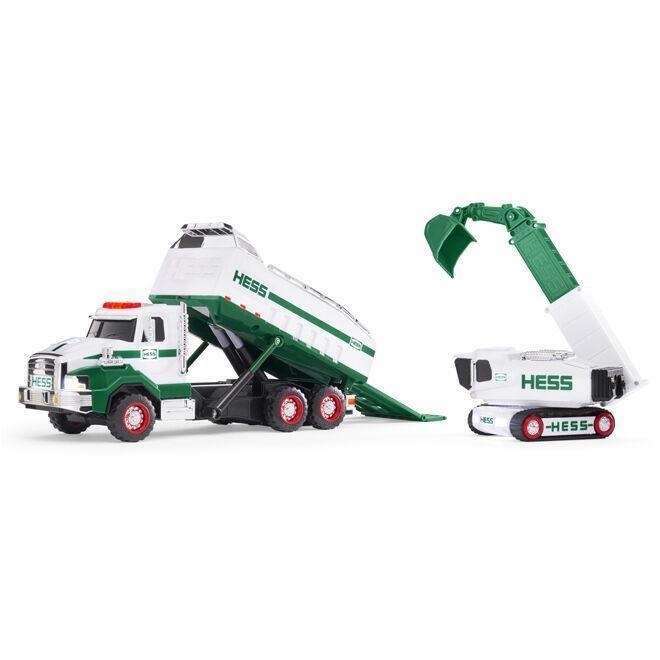 It also features a dual-direction motor (another Hess Truck first) that drives the vehicle forward or backward while the bucket arm and shovel do the heavy lifting. This off-road truck comes with working lights, oversize tires and a raised chassis. Buttons on the cab roof activate two different engine sounds, a horn and flashing lights. Then there’s the high-powered cargo: two twin-engine motorcycles with working lights, friction motors, chrome detailing and racing-suited riders. Updating the 1995 model with a newer truck cab and 31 individual working lights, this truck and helicopter features inlaid sequence lights on the landing deck of the truck and a more modernized chopper -- complete with free-rolling wheels. This two-in-one toy features a huge rotating ladder that extends three additional levels, two fully operational rotating searchlights and three mesmerizing siren sounds. The Rescue Vehicle is a jeep with lights and a friction motor to get to places the Emergency Truck can't reach. 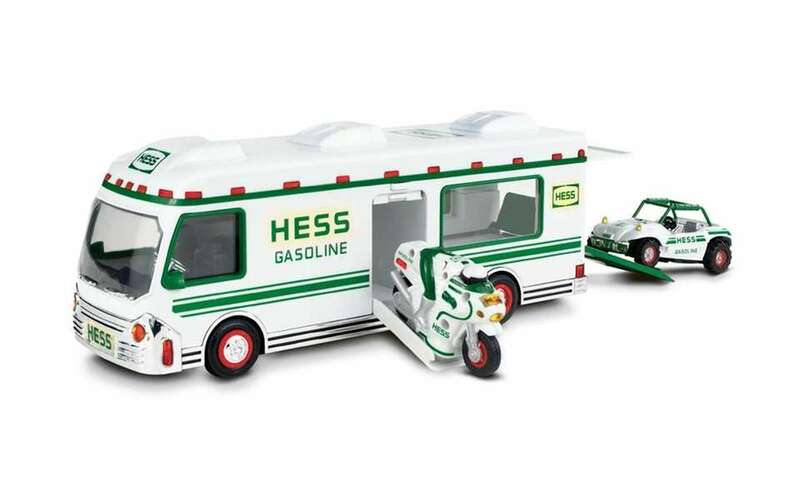 The Hess Toy Truck celebrated 40 years with the Sport Utility Vehicle and Motorcycles, which broke new ground for the line. It was the first toy to use an SUV as the primary vehicle and the first vehicle to have shock absorbers and all-terrain tires, so it actually bounces like a real sport utility vehicle. This year is the first time two motorcycles are included, each with realistic and working lights activated by a switch on the right handlebar. Nestled within this 18-wheeler are two sleek open-wheeled race cars, each piloted by a helmeted driver and their pull-back motors. You can unload the two race cars from the trailer's uniquely pivoting internal double-decker ramp. The cab of the 18-wheeler flatbed tractor-trailer glows with chrome details, and the curved green fenders and rounded headlights recall an older Mack truck. The three-wheeled motorized biplane has a red three-bladed rotor that spins at the flick of a switch or the press of a button. The other notable feature is a small goggle-wearing pilot manning the plane -- the first face to appear with a Hess toy. This three-toys-in-one holiday hit features interior and exterior lighting, a pivoting searchlight and compartment doors that double as ramps with a push-button release. A dual-function switch controls the lights and sets the rotors whirling. The two smaller vehicles featured push-friction motors and working lights. This white tractor-drawn ladder truck has green Hess logos and accents, as well as black molded hoses and tires. Chrome-colored details adorn bumpers, running boards and stabilizers. Removable accessory ladders line the truck’s sides and an additional three-tiered ladder extends 21 inches and rotates 360 degrees. Hess boldly went where its toys had never ventured -- outer space. The Toy Truck and Space Shuttle with Satellite came with six batteries to unleash a variety of lights and sounds that roar, beep and flash in various combinations. Press the red button above the shuttle cockpit to make the cargo doors open, and the detachable satellite rises from the bay and its retractable solar panels fall into place. The recreation van has a number of innovations, including a friction-powered, wheelie-popping motorcycle. The motorcycle is lit up by twisting the helmet of the driver, and when it's revved up and balanced on its back tire, it wheelies away. The dune buggy, with working headlights and taillights, interior and exterior details, and roll cage, also has a push-friction engine. The RV has 30 tracking lights, a side compartment door that turns into a ramp, and a back door that opens when you press the license plate. 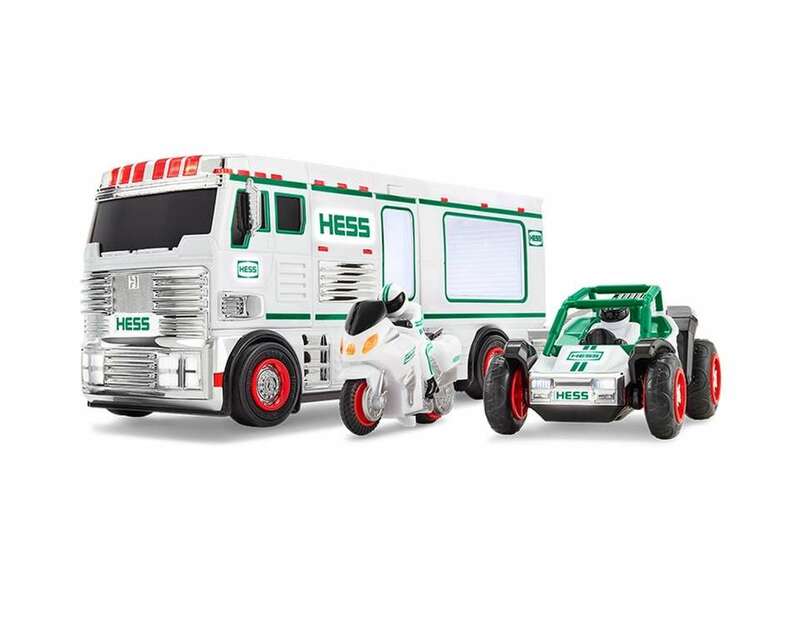 This lighted box trailer with two push-friction race cars was the first three-toys-in-one offer from Hess. The racers are unloaded by unlocking the rear door and using the pull-down ramp. Two very different cars roll out -- one green with white accents and a "spoiler" at the back, the other white with green stripes and an exposed chrome front engine. From the chunky-treaded rubber tires to the imposing, angular cab, the Emergency Truck is a powerful-looking vehicle. It has a full suite of sounds -- backup alert, emergency siren and horn -- and lights, including a rotating high-beam searchlight. The rotating triple-tiered ladder extends to 15 1/2 inches. 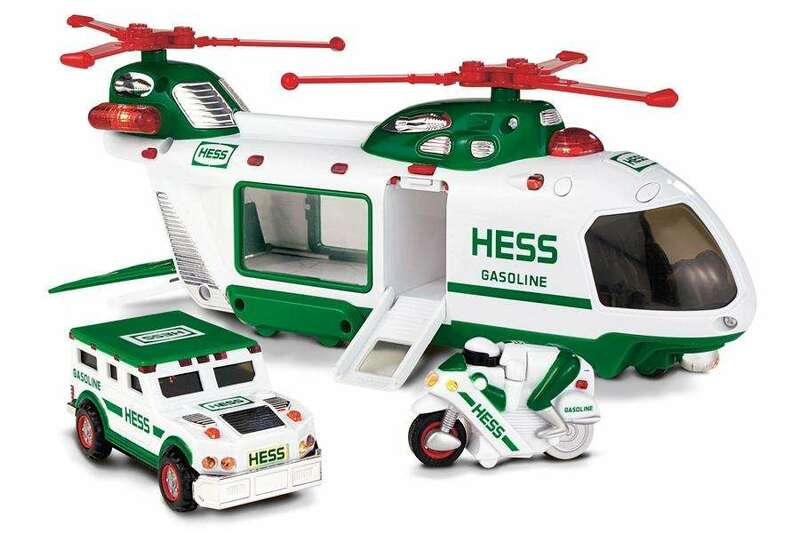 The helicopter, another first in the Hess lineup, has a red single-blade rotor that whirls at the press of a button or the flick of a switch. It also features a movable front-mounted searchlight, flashing lights and a rear spinning rotor on the tail of the chopper. The truck has 22 lights on the cab and 34 lights on the trailer, which also has indentations that match the helicopter's landing gear, ensuring a secure ride on the ground. This tow-truck-style toy has three high-energy sounds: emergency siren, horn and backup alert. Other features include emergency flashers; a three-tiered, 18-inch red ladder that rotates 360 degrees; retractable side-view mirrors, and two chrome stabilizers that can be released at the back of the truck. 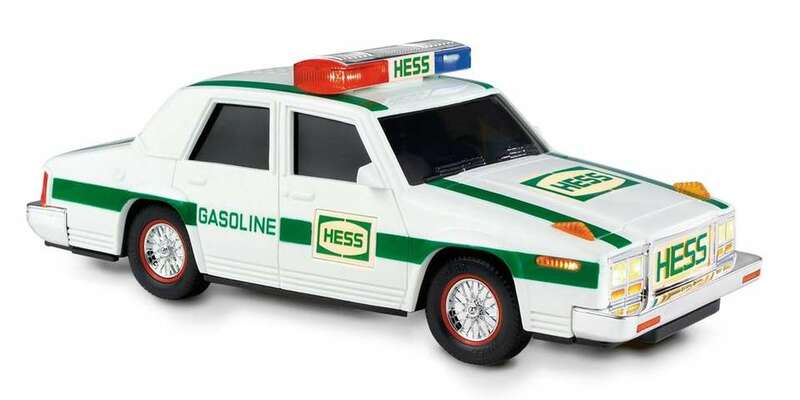 The first car ever featured in the Hess line, this law-enforcement vehicle has eight illuminated Hess logos, plus flashing red, blue and yellow emergency lights that can be coordinated with two realistic siren sounds. The Patrol Car broke all major Hess sales records when it debuted and sold out long before Christmas. This truck contains 31 lights in addition to some high-speed cargo -- a racer that sits behind display windows on the sides of the trailer. The two watch batteries power the racer’s headlights and taillights, and the car sits on a black platform that slides out from the truck. This Truck and Racer combo updated the 1988 model. The racer motor was reconfigured to allow for continuous rolling action. Green stripes on the truck's sides create a more streamlined look. A split windshield on the cab further differentiates this truck from the 1988 model. The truck is illuminated by white, amber and red lights. A powerful melding of design and construction, this tanker has 34 lights, including logos and an internal cab light and a cool new sound feature: a three-way switch to activate the horn or backup alert. In case you were wondering, check out the very first Hess Truck from 1964 below. The Hess Fire Truck Bank was the first white fire truck to feature built-in sound effects. At the flick of a switch you could hear a dual-sound siren. Another switch on the undercarriage activates the lights and emergency flashers. The year 1988 was a first for the company because it featured vehicles not based on actual Hess trucks. 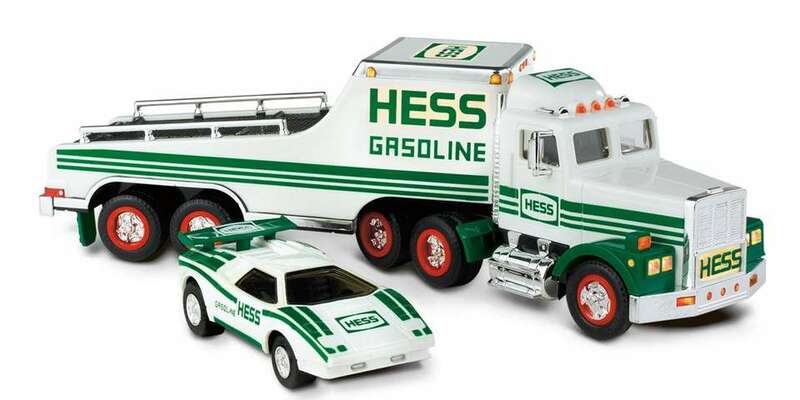 It was also the first time Hess featured two-toys-in-one, license plates with the year of issue, making it easier to identify the truck by model year. The combo featured this year was a trailer truck and a GT-styled, friction powered racing car. The famous "The Hess Truck's Back" jingle premiered in the 1988 television ad. The Hess 18-Wheeler Bank was the first white trailer and the fourth Hess bank. The coin slot is in the top of the trailer and the back trailer door lets you access your money. It features chrome details, a full complement of lights, and a side door that slides open with three green Hess oil barrels. This was the second fire truck in Hess toy history which featured a coin slot. The ladder truck featured flashing dome light, headlights and taillights, each operated by their own switch. The ladder swivels 360 degrees and has gears, ensuring it can be locked in place. 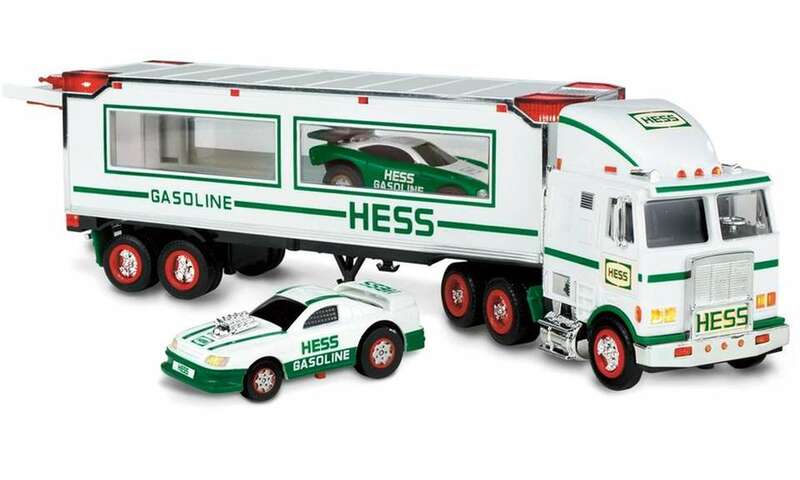 The First Hess Truck Bank took the 1982's replica of Leon Hess's original Chevy and added a bank feature. Children could access the money by turning the knob beside the slot. For the first time since 1966, Hess's box art placed the featured truck in a contextual setting for a full panel. This truck was an update from the 1977-78 Fuel Oil Tanker, where Hess introduced the first-ever coin slot at the rear of the tanker. 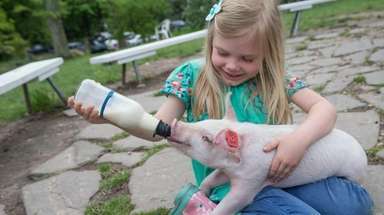 Children could access money by turning the cap at the back of the truck. The unique coin slot idea because the major feature of the next three releases. This was also the last Hess truck to use a single D battery. 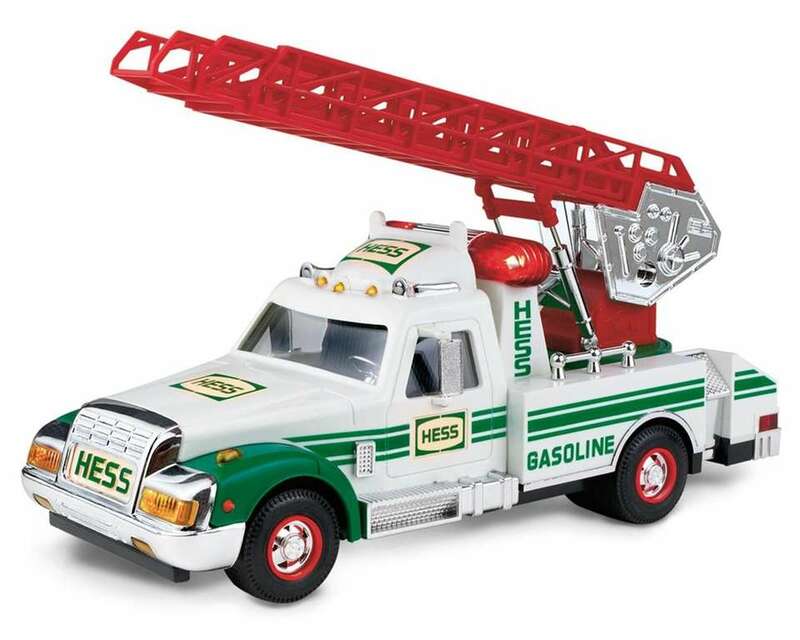 The First Hess Truck ranks one of the most detailed toy trucks in the series. It's a replica of the secondhand six-wheeled Chevy that Leon Hess drove in 1933. Mr. Hess's original Chevy is on display at the Hess corporate offices. The truck was painted in the original Hess quartet of colors and features opening doors that reveal the interior, working lights, rubber foot threads at the door, and a rubber oil-delivery hose that spools and unspools. The Training Van was modeled after the GMC Royale motor home used by the company to conduct training sessions at Hess stations. Features include a working side door, a pop-up TV antenna, and headlights and taillights. For the first time ever a lighted Hess logo was added to the side of the vehicle. The Training Van also gained recognition from Hess's first-ever television commercial. The 1978 holiday season offered a slightly different version of the prior year's model. The truck has the same lights and design but the lettering in the Hess logo is bolder and at the back of the truck. The updated Fuel Oil Tanker features a chrome grille, the second truck with such detail. 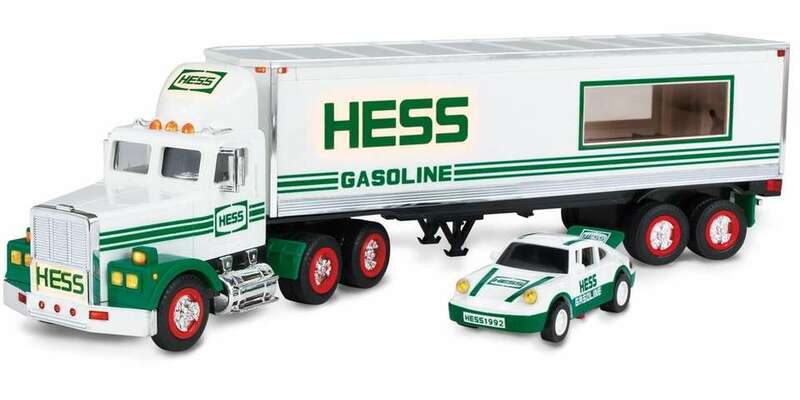 The major differences in this model is the "HESS" lettering on the side of the truck is bigger and the red stabilizers have been redesigned for balance. The rubber tires are marked with "Amerada Hess," due to the company's official name change after its 1969 merger. The 1975 and 1976 Hess Box Trailers are nearly identical models to the previous year with one major difference. 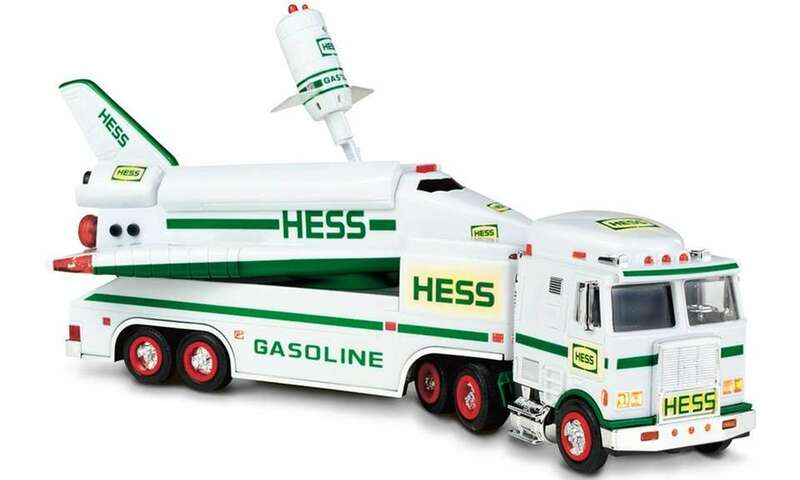 The oil barrels featured with the truck have the Hess logo unlike the year before. The Hess Box Trailer was the first fleet of trucks to have sliding side doors and working rear doors. Behind the doors are three removable miniature oil drums. This truck was also the first to have a full driver's window. The 1967-69 Hess Tanker Truck returned for the 1972 and 1974 holiday season which was a wise but cautious decision by Hess. 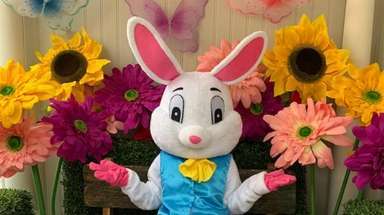 The truck had minimal updates and the company was able to offer a low-cost toy despite the inflation that the U.S. economy was facing during this time. One noticeable change in the '72 and '74 models was the stabilizers are round and the 1967-69 stabilizers are square. 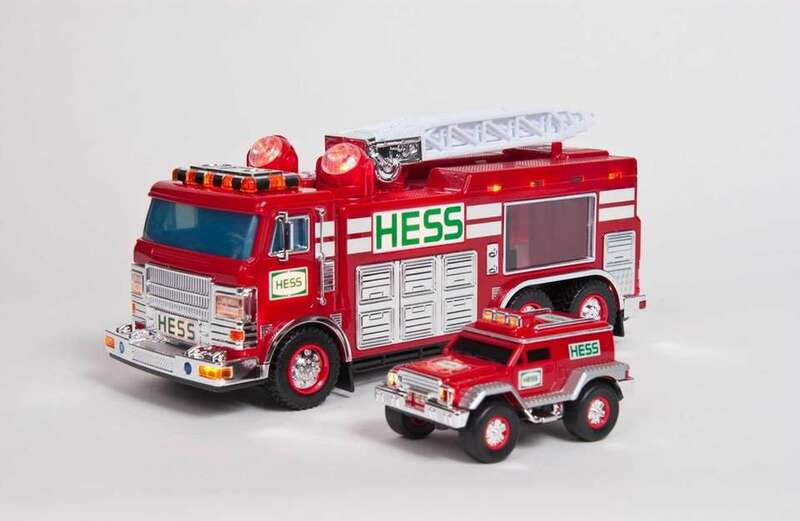 The Hess Fire Truck is a replica of a truck used in the company's Port Reading Refinery in New Jersey. This was the first of four fire trucks in the Hess collection. The truck features two detachable rubber hoses on one side and a detachable ladder on the other. It also includes a swiveling water cannon, working emergency light that rotates atop the cab, and the bottom of the truck is completely chromed. The '67 truck returned for the next two years with one change, the velvet bottom was replaced with the original white bottom. 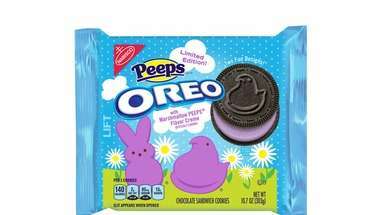 The change emphasized the company's commitment to excellence, affordability, and great value. The only difference between the 68 and 69 model is the back of the box features the words "Woodbridge, N.J." was replaced with "Perth Amboy." Commonly referred to as the "Red Velvet Tanker Truck," this eighteen-wheeler has working headlights and taillights with a flexible hose. A unique feature that sets this truck apart from other collections is the red velvet feature on the bottom of the box which doubles as a display stand. The Hess Voyager first sailed in 1962, and the Hess Tanker Ship is an actual replica of the ship.The 18-inch-long tank is the longest of any Hess toy and includes propellers, anchors, flag, a bow, stern, starboard and port lights. 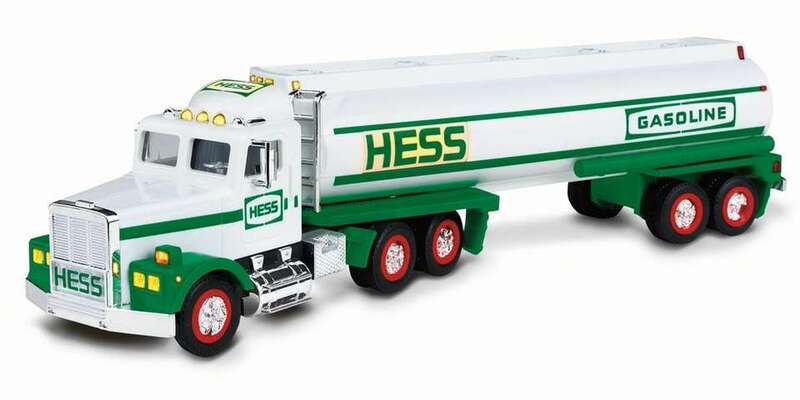 The truck that started it all was based on the Hess tanker trailers that delivered gasoline to Hess stations. Features include a red funnel to fill the cargo tank, a flexible green delivery hose to empty it, and working headlights and taillights. Truck aficionados will recognize the vehicle as the classic Mack B series truck, one of the most popular models of the ’50s. 100 classic toys we loveFrom classic windup toys to iconic collectibles, board games and more, here are 100 classic toys. 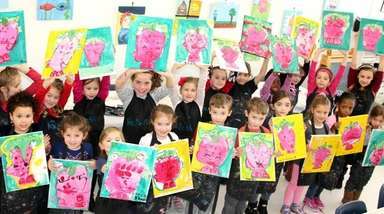 Historic photos of kids' favorite toysTake a look back at classic Long Island, NYC kids and adults playing with toys from Newsday's archive. 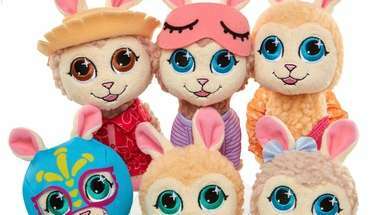 20 top collectible toysThere is a collectible line of toys for every type of kid this year.